What kind of conditions am I talking about? When there’s poor lighting and little time to get the shot. The photo below is a good example. It’s a shot of an adult Red-shouldered Hawk that was taken very late in the afternoon. The sky was heavily overcast, causing some dim lighting conditions. Typically when you encounter a raptor, the bird is spooked easily if you get too close, so you have little or no time to use a tripod. Handholding the lens is necessary to even pull off a couple of shots. This is a situation where I would never even try to photograph with either of the above mentioned lenses. 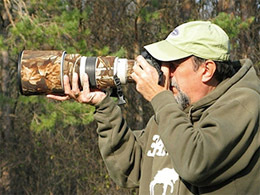 True, the Canon EF 300mm f/4L IS has Image Stabilization, but 300mm wouldn’t have been nearly long enough to photograph the distant bird. Using a 1.4x Teleconverter would’ve forced me to use f/5.6, and if I used this combination the proper exposure would’ve been a slow 1/320 second at ISO 400. Using a 2.0x was another option, but that would’ve caused a significant loss of sharpness. On the left, I’m holding my 400mm f/5.6 lens which weighs 2.8 lbs. versus the lens on the right: a Canon 300mm f/2.8 lens with a 1.4x teleconverter (making it a 420mm equivalent) and weighing in at 6.5 lbs. (more than twice the weight of the 400mm f/5.6). The question is: which lens will offer the best potential in dim lighting conditions when there’s little or no time to use a tripod? The answer is the heavier lens, the 300mm f/2.8 with a 1.4x teleconverter. Why? The IS on this particular lens is outstanding and its sharpness is second to none in the field of camera lenses. Yes, it does cost almost four times as much but without it you go home with either a shot not taken or an inadequate one. So, you have to ask yourself a question in instances like this. Is your equipment limiting your potential for good shots? 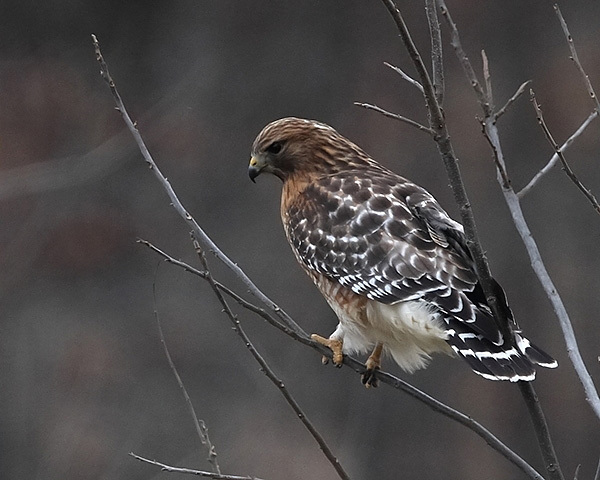 In the case of the Red-shouldered Hawk photo above, the answer is yes! Instead of the 400mm f/5.6L, I used the Canon 300mm f/2.8L IS with a 1.4x teleconverter and my settings were f/4 at 1/640 second at ISO 400 and with this combo I was able to capture an acceptable photo. Now that I’ve been using the Canon 300mm f/2.8L IS lens for close to a year, I can say it has improved my good shot ratio over the 400mm f/5.6 by a significant amount. Shots I never even dreamed of taking have become routine. 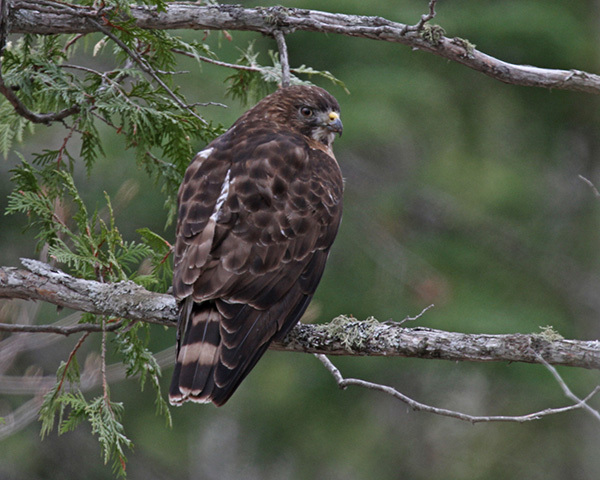 This is a photo of an adult Broad-winged hawk taken very early in the morning on an overcast day. I was driving down a bumpy gravel road making about as much noise as possible when I stumbled upon this bird perched in a tree along the roadside. Having just enough time to swing my camera to the window of my vehicle, I got off one shot before the bird took off. I was using my 300mm f/2.8 with a 2x teleconverter (resulting in 600mm equivalent). Because of the dim lighting I had to use f/5.6 at 1/320 second at ISO 400 for a good exposure. These settings would’ve resulted in a worse image if I used my 400mm f/5.6 because I would not have IS available and the image would’ve been 2.25 times smaller in my frame. The resulting photo, although not tack sharp, is more than acceptable. 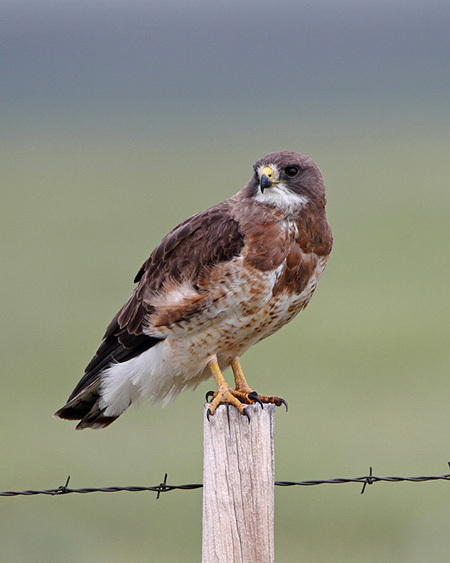 This Swainson’s Hawk was shot at virtually full frame in dim early morning light with the 300mm f/2.8 and a 2x teleconverter at f/5.6 and 1/400 second at ISO 400. The resulting image is quite pleasing and one I never would’ve captured with the standard lens I had previously used. The bottom line is that if you want to capture better photos by increasing the range of opportunities presented to you, then explore what lens you need to do that with. For me, the quickness that I can use the 300mm f/2.8 and the range it gives me was my choice. After gaining experience with this lens I discovered that the IS can still be used when the lens is on a tripod, something the 300mm f/4 IS can’t do. This has opened even more opportunities for me and now I can use even slower shutter speeds in dim light and get even sharper photos. Just a week or so ago Canon announced the new Canon EF 300mm f/2.8L IS II USM which has upgraded features. They include lens coatings to achieve better images by reducing reflections, a decrease in weight and most importantly, an increase of the range that the Image Stabilization can be used. This last feature alone will allow even slower shutter speeds than the current lens and also performs better when panning a bird in flight. I will have a long hard look at this lens and may even replace my current one when the time comes. Another decision of when to upgrade! There is no doubt these high end lenses are superior in all aspects, however, unless you have money to burn and/or are a professional photographer such as yourself, the exorbitant cost of these lenses do not justify the end result. An analogy would be, buying a Ferrari Enzo just to go to the grocery store. Prior to buying the Canon EF 70-200mm F/4 and the Tamron 150-500mm F5-6.3 APO OS, I spent months going over reviews, agonizing over what to buy on a budget. Many of the comments from those who purchased the high end lenses gave me the impression anything less would be a waste of money. When reality set in, with trepidation, I knew I realistically had no choice but to buy the “inferior lenses”. I miss shots for reasons you indicated, I delete many more than I keep for the reasons you indicated. But with enough practice and patience, the results were far better than anything I expected and some have been on display in the local art gallery and coffee shops. Driving that Enzo would be a dream come true and will never happen, but I can still bring the groceries home. Great article, awesome photos and some excellent information I will take to the field with me. Thanks for the comment! The lenses you own are excellent lenses and capable of taking stunning photos. They are far from “inferior.” I personally own the Canon EF 70-200mm F/4 too and consider it one of the best lenses on the market for sharpness, contrast and ease of use. Thanks for all this information here, I shoot a lot in the Everglades sometimes it is birds and sometimes it is bugs. I use a Tamron 300.mm macro zoom, although it only gets f4.5 sometimes the photos are tack sharp. I have a Sony Alpha 850. With a doubler in place I do get some good bird shots. I am a hand shooter and I hate the tripod. Thanks for the comment Ray! That particular lens is very versatile and offers a lot of variable shooting conditions. Perfect as a handheld lens too, the f4.5 is good for low light and keeps the weight of the lens down for ease of carrying into the field. You probably use a beanbag when shooting from your window. Take a look at the Puffin Pad at puffinpad.com. I am the co-inventor of the Puffin Pad ” a lightweight alternative to the beanbag @ 3.4 oz” . The pad base is made of closed-cell automotive foam with a 1/2 inch memory foam pad on top… it nestles your lens in any position. When slotted on the car window it stays there at speeds of 50 mph. Ken, thanks! Yes, I do use a bean bag on occasion. Your product, the Puffin Pad, looks great. I’ll order one and give it a try. This might be a good topic for a future PhotoNaturalist article, the use of window supports for better sharpness. Further, it will be a great help to get your suggestions on up-gradation of my existing Photography gear.